I don't feel too stupid asking for help in identifying this battered old soul, above, which was in the trap this morning along with a Dotted Border and a Clouded Drab. I'd hoped to crack it from books or the web because of what appear to be distinctively raked wings; but I can't see anything which gets me shouting 'Bingo!' My best guess is a Lead-coloured Drab. I'd be much obliged for anyone else's views. Update: Many thanks to Ben and Dave for kindly sorting this out in Comments. It's a Common Quaker and if I'd looked more carefully at the one in the previous post, I'd have seen that nice bit of skirting pattern on the wing edge. I think I get misled and baffled by the colours, and need to look more closely at such things as wing shape and pattern. But will I ever..? Thanks v much again, both. 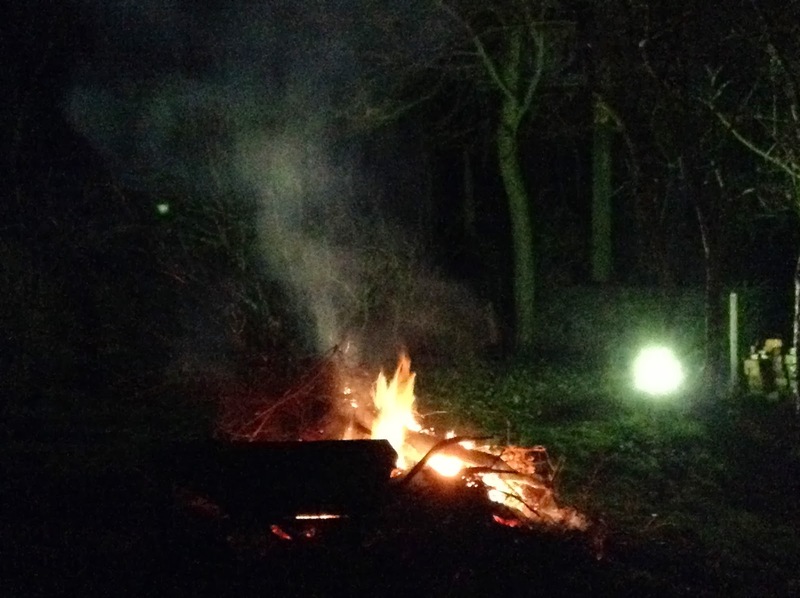 The trap started the night excitingly, with a revival source of light - and much-needed warmth - from the embers of our bonfire. It had been a good day in many respects; we were able to cross the Cherwell for the first time since December on a walk with friends; on reward was a long and mutually curious encounter with this Roe (I think) Deer. Here are the other two moths and I must now go and have a shower, breakfast and all the rest. Steady on! Things are getting hectic. FOUR moths in the trap this morning, though (I think) three of them are the same species. It's an old familiar, the Common Quaker, but these are my first for 2014 so my modest little list is growing. It's not really light enough to take photographs outside at the moment, during my brief opportunity between falling out of bed with a yawn and taking Penny the tea. So I brought a couple of eggboxes indoors and that may account for the straphanging expertise shown by the Common Quaker in the top picture. He or she'd be OK on the London Underground. The various Quaker moths are named for the simplicity of their garb, a Quaker attribute in the movement's early days when Friends also preferred to 'count themselves among the silent of the world'. This didn't mean that they weren't setting a shining example in the way they conducted their lives, but they thought it better not to join the ranting and evangelism which leads to so many problems involving religion. Maybe we could do with more of that restraint in these noisy times - not that I am one to comment, what with blogging, Twitter etc. The fourth visitor was this somewhat worn Pale Brindled Beauty whose bristly leading edge of the forewing caught my attention. Sorry the focus isn't 20:20 but here are the tooth-like bristles close up. I think it's the right antenna, peeping out from beneath the wing. The year's first micro-moth has arrived in the common but always striking form of the Common Plume. Its appearance is timely as only yesterday we were worshipping our little granddaughter Emily and the Plume's scientific name is Emmelina. In full, it's Emmelina monodactyla, or 'Emmelina One-winged', as opposed to Emil Wainwright, or 'Emily the maker of haywains'. I keep thinking that I'll put the trap away again as the takings are so sparse at this time of the year, but the weather last night was very mild, if blowy, and there were another two moths inside the eggboxes this morning: a positive crowd compared to the one-at-at-time pattern up to now. The others were a scruffy Satellite, as ragged as the eggbox it chose but with its spaceship markings nice and clear. And a Chestnut, dozing quietly away at the bottom of the pile. It was very early when I checked things this morning and the light outside was poor for photography, in my incompetent hands. So I took the Satellite and Emmelina indoors to use Miranda, my little camera tripod - I like all these nice girls' names for moths and pieces of technical equipment - and got the more stable shots with Private Eye in the background. Interesting to see how light and camera angle change a moth's colouring, as with the two different Satellite pics. Here's a final one of Emmelina too, doing that 'Spitfire banking' thing which children used to do in the playground in my young days (along with a yell of 'Eeeeeeyaaaawwww...du-du-du-du' as you went in for the kill). 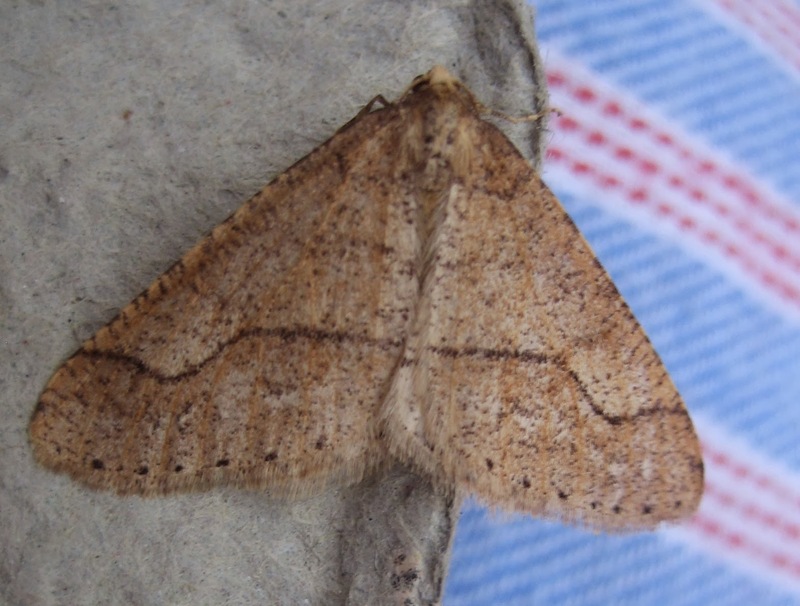 The Dotted Border, which called again on Friday night, is a lovely moth which might make an excellent symbol for the likes of Costa or Starbucks. Here are a couple of pictures of the most recent arrival which perched quietly on th edge of the bulbholder and could easily have scooted off had it not been fast asleep. Butterflies always have their eyes open, since they do not have eyelids and they probably do not dream. It's more like a deep rest without sleep. Like yoga! 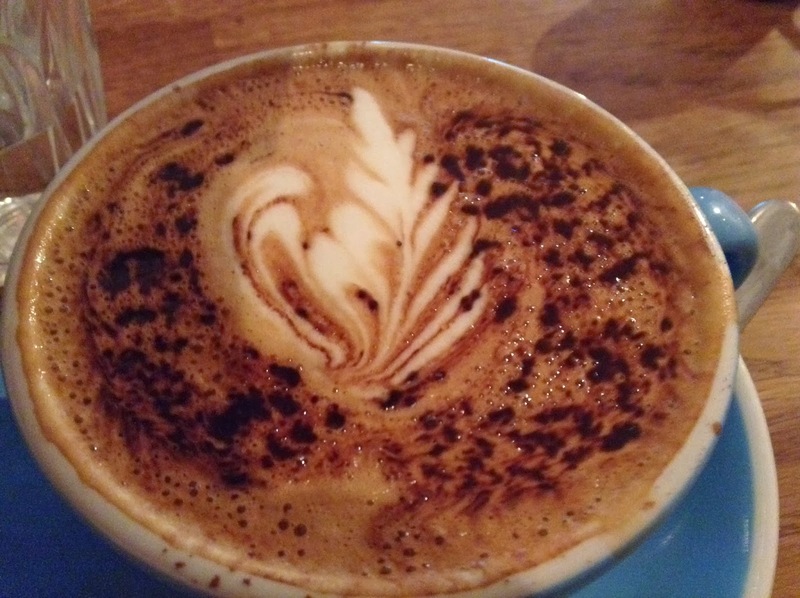 Here, back on earth, is a picture of my most recent Flat White coffee on which a Dotted Border could probably camouflage itself. Two non-mothy things: shown above is another use for eggboxes - chitting seed potatoes. 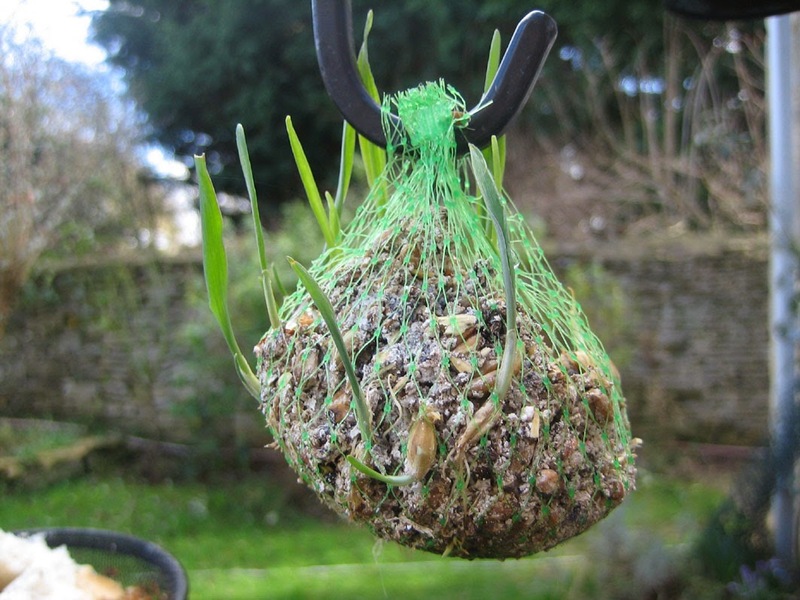 And why don't the birds of this part of Oxfordshire like fat balls? Ours is turning into a little hanging garden of Kidlington. Another singleton in the trap last night, which was very mild and saw the lamp almost obscured by a short stretch of the dreaded Leyland cypress which survives in our garden. It's a Hebrew Character, an annual visitor since I started trapping in 2005. Later in the year, they come in some numbers. In terms of names, this is a cosmopolitan moth. Its English name derives from the resemblance of its strikingly prominent dark markings to the Hebrew letter Nun. Linnaeus added a typeface element to this by calling it Orthosia gothica. There's another UK moth called the Setaceous (or bristly) Hebrew Character which has a similar though slightly less distinctive mark. But they are not related. I am just old enough to remember a few copies of our Deutsches Leben textbook at school being printed in Fraktur - the German Gothic or Blackletter typeface which was inflicted on that poor country in the name of culture for a large part of the 20th century. The moths came good again last night, or rather I should say 'the moth'. For the second night running, there was just one resident in the trap, but it was a pretty and interesting one. It's a Dotted Border, common but new to my list because I'm normally in bed in February and not inclined to light the lamp. It's another moth, like the Pale Brindled Beauty featured two posts ago, whose female draws the short straw and hasn't any wings, as per Richard Lewington's marvellous pictures from my Moth Bible. If you look closely, you can see that Mrs and Miss Dotted Border actually fare worse than the lady Pale Brindled Beauties. Insult is added to injury in that they have vestigial wings, but ones which wouldn't get them very far in flight. Unconcerned by such gender issues, my handsome male Dotted Border was good and lively after a very mild and largely dry night, unlike the zonked-out Dark Chestnut on Sunday morning. I was hoping to get a picture of its pallid underwings with their prominent dark spot, but I moved clumsily and the moth got into a flutter. Before I knew it, it had flown daintily away across the lawn. Glory be! A dry night at last and so the moth trap was lit, if only to see of anything small and with wings had managed to survive the downpours of the last month and more. Lo! One moth had; this Dark Chestnut which was as deeply asleep (top pic) as any of the students just down the road after a Valentine's Night bender in Oxford. In their honour, I have made a vaguely heart-shaped close-up of it, above. Update: sorry, my first mis-ID of 2014. So soon... It's a plain Chestnut, not a Dark one (even if it is rather dark). Peter Hall kindly puts me right in a comment on the excellent Upper Thames Moths blog to which I also post. Many thanks to him. The moth was still asleep when I gently turned it over to rest on my lovely Christmas nightie (whose Scrooge-style matching cap I will feature in due course, later in the year). Another species abroad is the Red Sword-grass; a very nice one was Tweeted to me by a friend of a friend seeking an ID. 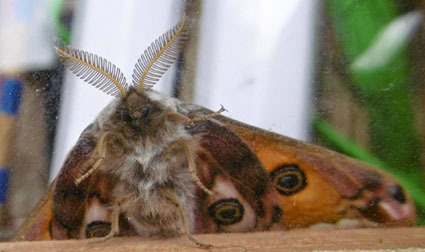 In the hope of getting one myself, or even that enticingly-named moth the Spring Usher which is also on the wing in these dreary February days, I have turned on the lamp again tonight, in spite of forecasts of the rain coming back. 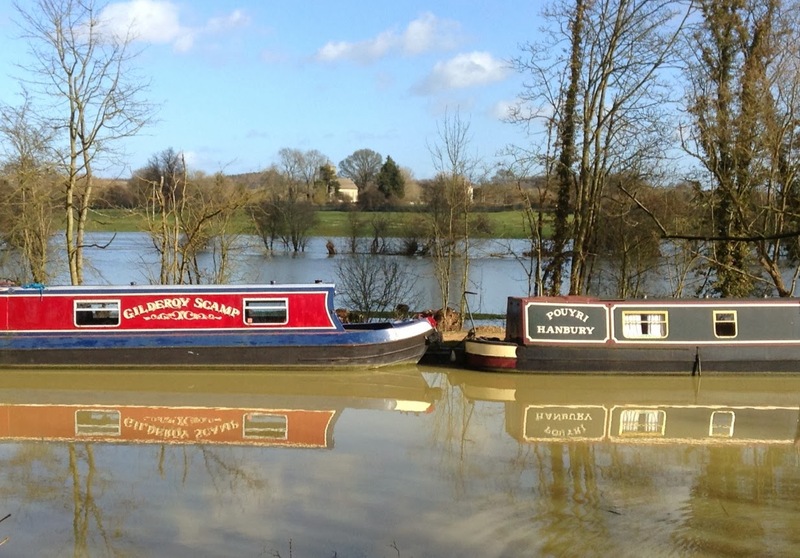 We have been lucky with the flooding although it is very nearby, as you can see from this picturesque view of the canal with the lovely remains of the deserted village of Hampton Gay in the background. Penny and I thought that POUYRI was a Welsh or possibly Hindi word but the very nice owner explained that it's an acronym. I won't spell out the whole thing on what is essentially a family blog, but the last four letters stand for 'unless you are invited'. I've just had an enjoyable but distracting visit to Newcastle, Peterlee and Durham - the last seen above from the train - so I'm a bit late with this brief addendum to my sudden early February post. It's partly to show you the lamp back in action after its long Christmas and New Year sleep - below - but also to express sympathy with the female Pale Brindled Beauty. When I was identifying the moth on Monday morning, I read in my bible that 'the female is regularly found at the foot of tree trunks, just after dawn.' Since the trap was at the foot of an apple tree and it wasn't long after dawn that I was making my inspection, I initially thought: "Ah! So this is a female." Then I consulted the picture in my bible and saw, as you can below, that a female is one thing that my moth definitely isn't. This species is one of about a dozen common UK moths where the woman gets a really bad deal. They are wingless. I mean, imagine being a moth and not being able to fly! What else do they have going for them, really? I have had a preliminary, skimpy search on Google as to why this happens and why it is always the female, without success. My super-bible is also buried in stacks of books still awaiting shelves as we move closer to our first anniversary in our new home. But patience is a virtue and I will return to this mystery when I can. For the first time in weeks - actually since 9 December which also saw our granddaughter Emily make her debut in the world - the light shone out here last night. For once, there was no rain overnight but I admit that I went to inspect the eggboxes in the expectation of finding nothing. At first this appeared to be the case. But then, crouching in the most inaccessible part of the bulb-holder, I spotted a nice-looking moth. The problem was getting the camera anywhere near it. Luckily it was sleepy enough to fumble its way on to a shard of eggbox which I then transferred to the most Springlike of our daffodil shoots. Hey Presto! Above is the result: a Pale Brindled Beauty which has the distinction of being my first moth of 2014. Here it is again, below, after a second transfer on to my Christmas pyjamas (the ones familiar to regular readers are in the wash). It's a lovely moth with, I think, just a hint of green in those greyish wings, brought out in this third picture (although that may be a trick of the eye, with the green daffodil shoots there as well). All the eggboxes were empty but the, underneath the final one to be lifted out, was Moth Number Two: a little Chestnut if my wavering skills at identification are correct. Finally, Penny and I were struck by the shape of this Elder tree bole, below, the sort of 'found object' which got the likes of Barbara Hepworth and Henry Moore excited. To me, it resembles the engine of one of the old Royal Flying Corps biplanes which my Grandad flew long ago. But I don't think there's any connection or structural copying by the makers of SE5A Scouts.